The Alchemical is a complex of creative studios for theatre, photography, music, education and the visual arts, run by artistic directors Carlo Altomare and Gia Lisa Krahne. A true artistic laboratory where artists can engage in the research and development of new work through rehearsal, teaching, and performance. Our three white box performance theatres and four affordable, clean rehearsal studios are uniquely inviting spaces for rehearsals, performances, classes, workshops, readings, dance, photography & video shoots, fashion, lectures, auditions, screenings, art exhibits, and more. We are proud to run an organization which serves a great diversity of NYC and international artists – as both a safe haven to work and create in, as well as a uniquely inviting social atmosphere to find and create community and be supported as serious artists. We closely attend to the needs of everyone who works here, and strive to maintain a respectful and constructive atmosphere to support the community we happily serve. We are an artist-run facility and understand the importance of your work. By providing affordable creative spaces to emerging artists, as well as established organizations who seek The Alchemical’s intimate environment – we strive to catalyze our dedication to research into the contemporary meaning and nature of live performance. The Alchemical is also known as an unusually warm and exciting downtown salon for experimental theatre, music, fashion & performance. We are committed to developing the social potential of performance, and actively foster a real discourse between artists and the public. We regard the theatrical experience as a creative public assembly; the audience is an important partner in fulfilling our mission. Our aims are to present public events that are informative, inspiring and fun­, and to engender a meaningful engagement between artists and audience, and promote an atmosphere of congenial discourse and intellectual community among thoughtful artists and free spirits. Our events tend to attract other artists, affording the attending public a personal engagement rarely found in bigger, less colloquial spaces. At this time in New York City, it is not easy to find space to produce new theatre, music, art and performance. We are pleased that we can provide affordable spaces to artists and the public in that regard. We invite you to take a look at our website and give us a call at (212) 675-1390 to discuss how your next project might work at The Alchemical. I have always loved the work of producing and organizing a place where artists can develop and present their projects. It’s a privilege and a creative endeavor in its vision and attention to detail. Every day I aspire toward it being a work of art in itself. I see The Alchemical Theatre Laboratory as such a place. About 104 W 14 St The Alchemical occupies the full third floor and partial second & grounds floors of a charming five story building, conveniently located on West Fourteenth Street, between Sixth and Seventh Avenues. Our studios are also also great for photo shoots, offering lots of natural light. We welcome rehearsals, castings, readings, shoots, etc. 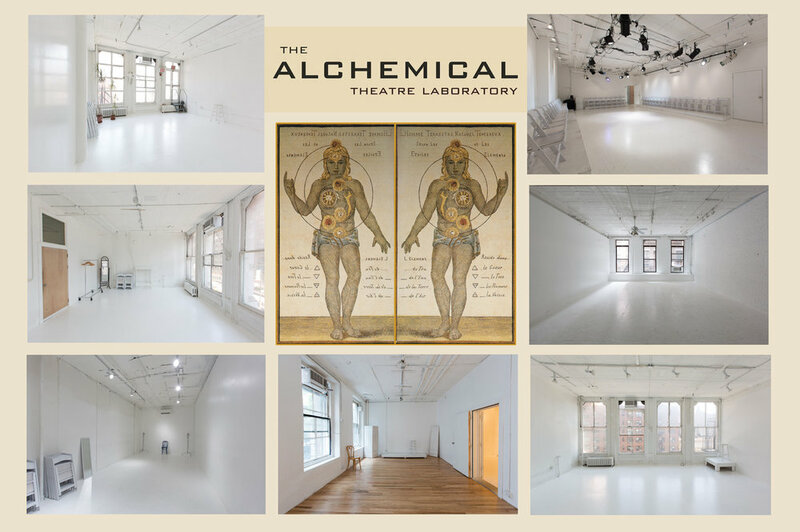 Three of the seven Alchemical studios are also active performance spaces: Studio A, the signature white-box performance theatre, with full theatre lighting, and modular platforms which accomplish an array of seating and staging configurations –– The Lab, a second 900 sf white box space with soaring ceilings and private bathroom isolated on the second floor –– and our newest & largest 1,400 sq ft Studio One on the ground floor. Each of the performance spaces also doubles as rentable studio space for rehearsals, auditions, classes, meetings, shoots and receptions rooms. Studio B often serves as a dressing room for performances, in addition to its rehearsal usage.